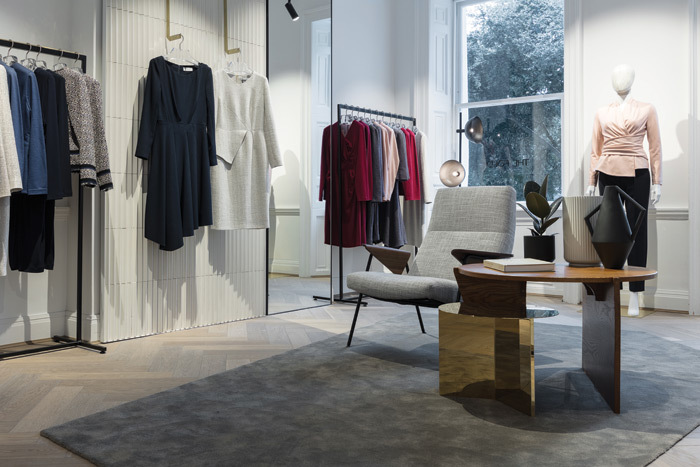 Contemporary British womenswear brand The Fold has opened its first flagship store in Chelsea, London. Designed by Kinnersley Kent Design, the flagship seeks to be more than just a retail store. Within this project the practice has designed both the store and an alternative retail concept. With the look and feel of a ‘Member’s Club’, it provides an effortlessly welcoming and relaxing space. The store allows customers to relax, drink coffee and use the iPads and power sockets at its central bar, all while browsing The Fold’s contemporary women’s workwear collection. This design encourages chance interactions and conversations between customers and staff to create an environment that nurtures professional women and embraces the need for networking and exchanging ideas. Preconceptions of a luxury womenswear store have been abandoned to create a space that empowers and celebrates professional women. It is therefore unsurprising that the allfemale design team supported British, female designers and artists throughout the project. The material and colour palette are gender neutral, if anything almost leaning towards masculine. KKD partner Jill Higgins explained that it wasn’t necessary to have a feminine setting as the clothes are feminine – ‘having a more neutral backdrop gives the clothes an extra edge and makes them “sing”’. It is this championing of British female designers that sets the store apart. With an all female design team, KKD sought out the most talented female designers and makers in all aspects of the design. Just like The Fold’s clothes, the store is designed by women, for women. ‘A highlight for the space is the bespoke cladding on the central bar and the artwork on the wall behind, both commissioned from material designer and artist Stephanie Tudor,’ says Jill Higgins. Situated on an established shopping street in Chelsea, within a Grade II listed property, the store already had a lot to boast about. KKD’s interventions do not seek to overwhelm the existing building’s historic features – but rather give the garments a platform on which to shine. Added clothing rails and furniture details all sit proud of the existing interior and are not attached to the period cornices and architraves that give the building its character. The store ‘does what the clothes do – takes the customer from 9am to 9pm’, says partner Jill Higgins. The space can be transformed in the evenings, to host a calendar of relevant and engaging events, in order to foster friendships and business relationships outside of the office. KKD has used a bespoke approach to allow the store to be truly tailor-made to The Fold’s needs and be flexible in all aspects of its use. Movable furniture and rails allow the store to be transformed into an events space. Just two aspects of the design being fixed – the island bars – are designed to function in each of the store’s different uses. Reflecting the brand’s core values was the overriding ambition in every aspect of the design. The brand’s philosophy is ‘to respect the woman we are dressing, and for our clothes to enhance rather than outshine her,’ explains founder and CEO of The Fold, Polly McMaster. 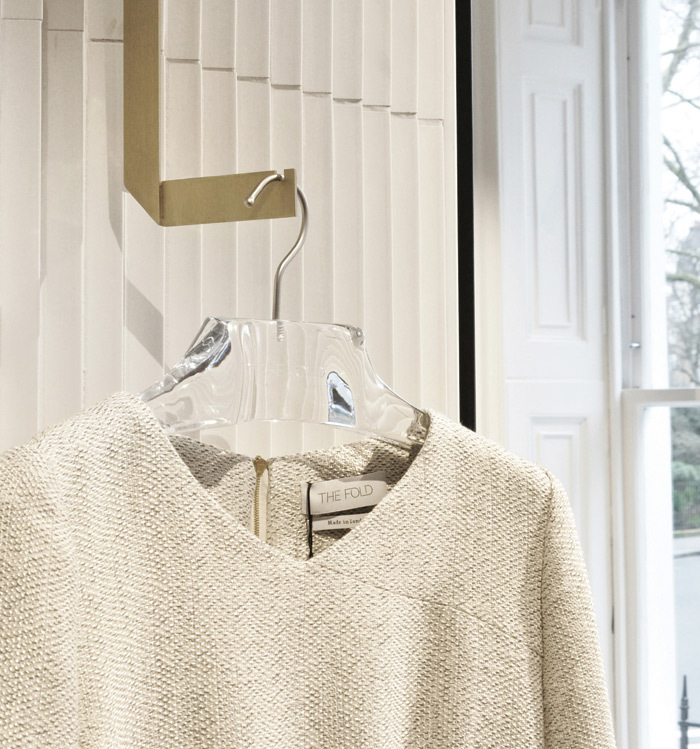 The simple, monochrome palette, with understated brass features and oak herringbone flooring adds richness to the clean lines of the design, while the simple folded brass hanging rails act as a frame to display the garments as the centrepiece. These simple and elegant accents add a sophisticated edge and echo the subtle details of the clothes – zips, fastenings, clasps. 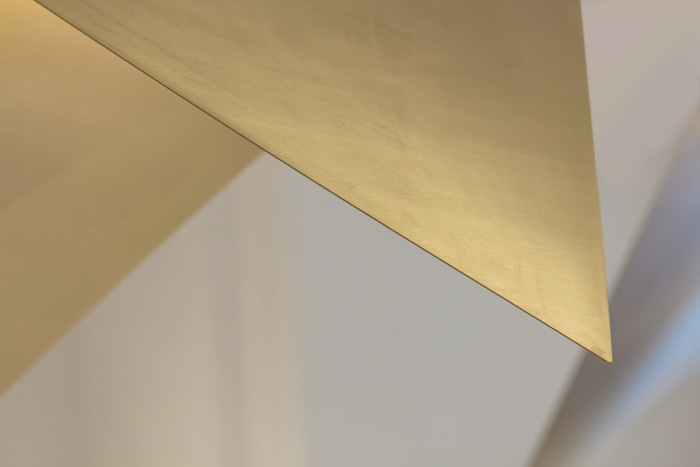 Attention to detail is key in The Fold’s collections, with their somewhat architectural, structured and folded seams, and this has been reflected in the bespoke folded brass details and the sculptural folded tables. The continuous folded elements throughout the project reinforce The Fold’s brand and begin to act as a ‘signature’. The Fold’s key values are consistently mirrored throughout the store’s design, aesthetics and use. The store is a part of an emerging typology for retail – one that Jill Higgins explains ‘is no longer about creating something static. It is about designing flexible spaces that change throughout the day, and that grow and evolve with a brand’.